The Southern Cassowary (Casuarius casuarius) is not quite a dinosaur but it’s very likely the closest thing to one that you will ever see. Well, I suppose that you could consider it a dinosaur, but if so then it would be a dinosaur that’s quite distinct from the ones that linger in pop culture (or were in a way invented by it). As the pictures show, the Southern Cassowary, also known as the Australian Cassowary, is quite a large bird — growing to be more than 6 feet tall (to at least 75 inches or 190 cm), and to weigh between 37 and 154 lbs (17 and 70 kilograms). Maximum weight is estimated to be 187 lbs (85 kilograms). Some females have been known to grow to as tall as 6’7 feet (2 meters). Females are notably larger than males, and possess a larger bill and casque (the crest looking thing on their heads). A very notable behavior of the species is that it’s the male that raises the offspring, and incubates the eggs, rather than the females. The females are apparently not involved at all in the chick rearing after they drop off the eggs and head off to do the same elsewhere (female territories overlap those of several males). Other notable qualities include: the ability to make extremely deep sounds (the lowest frequency bird-call known, and at the very lower limit of human hearing); the ability to run up to 31 mph (50 km/h) and to jump up to 5 feet (1.5 meters); and also the fact that they are very good swimmers, capable of crossing large rivers and also of swimming I the ocean. 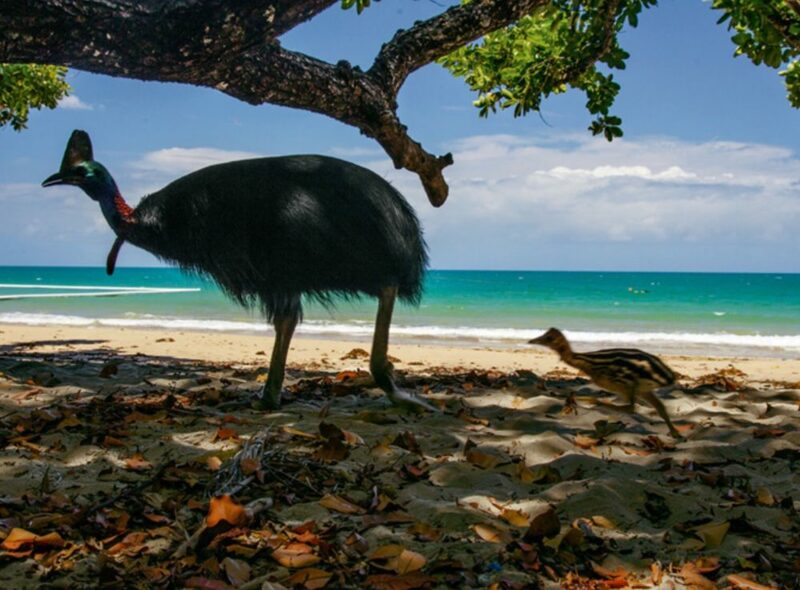 The average lifespan of wild southern cassowaries is estimated to be around 40 to 50 years. It’s not known how old they can live to be. 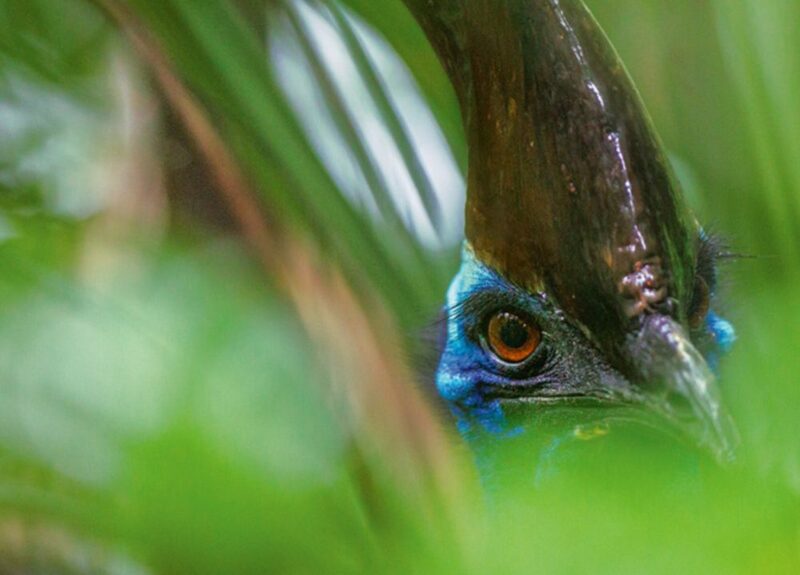 Southern Cassowaries are found throughout the remaining portions of the tropical rainforests of New Guinea, Indonesia, and northeastern Australia. As a result of the never-ending mass deforestation of the region; the accompanying habitat loss and fragmentation; the effects of feral, introduced boars/pigs, dogs, and cats; as well as hunting by humans; the species has seen a very large decline in numbers over the last hundred years. 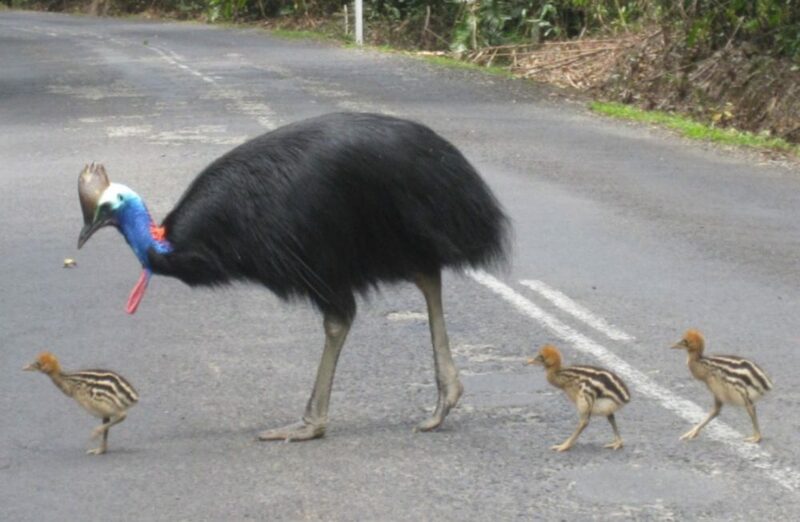 Car accidents are another major cause of death amongst southern cassowaries, with the species often becoming roadkill in regions with extensive roads networks. 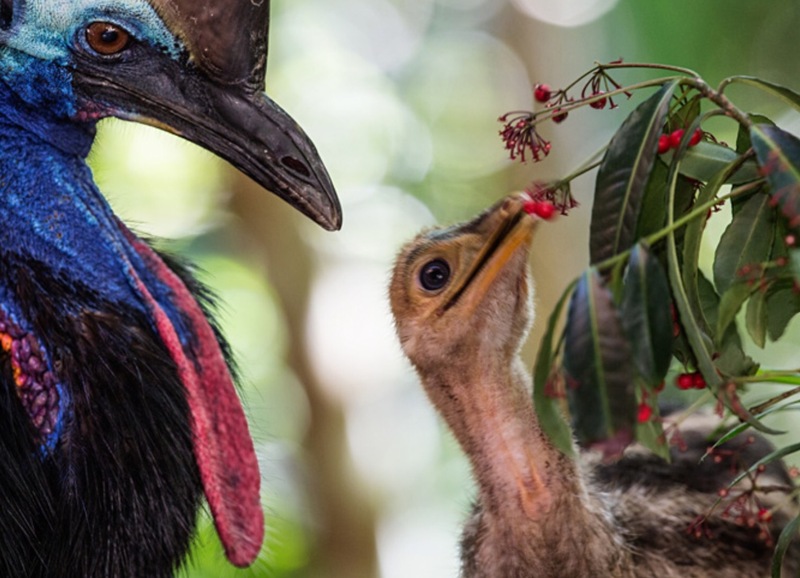 The southern cassowary is listed as Vulnerable (to extinction) on the IUCN Red List of Threatened Species, but the Australian population itself is listed as Endangered under Federal and Queensland State legislation. A 2002 study estimated a total species population of around 20,000 birds — with around 1,500 and 2,500 of these being in Australia. A later 2006 study found that only 20% to 25% of the species’ former range/habitat remains. Presumably population levels are even lower now as “development” of many of the regions in question has continued. Cassowaries are a type of ratite, being related to the extinct Moa of New Zealand, to the extinct elephant birds, to ostriches, to emus, and to the Kiwi and Rhea genera. They are relatively closely related to kiwis, having “only” diverged from one another some 40 million years ago. The species name derives from the Malay name kesuari. 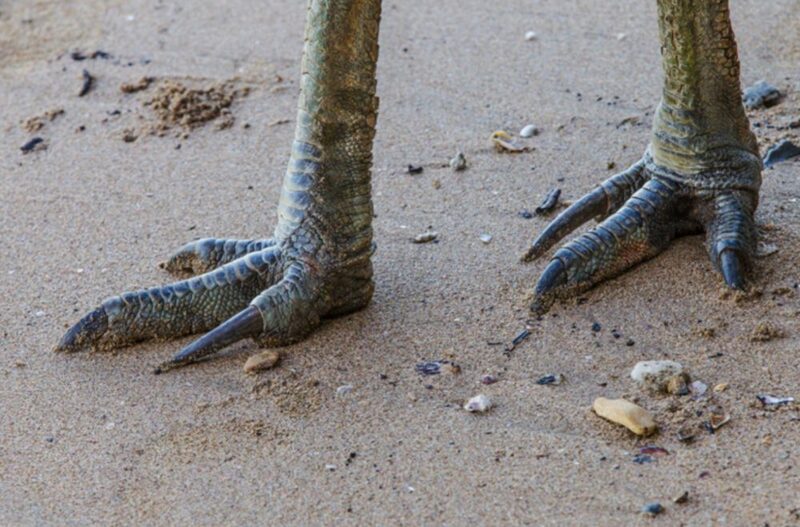 While there are a lot of reasons that they are dangerous, the large and lethal knife-like claws that have evolved from the inner toes is a very notable one. Overall the build of the legs is fairly robust, and the species is known to deal powerful and sometimes lethal kicks — with or without the knife-toe factoring in. Really take a look at those feet. Exactly what I would a guess many dinosaur’s feet looked like. The southern cassowary feeds on a variety of foods, but most of its diet is made up of fruits, of various types. 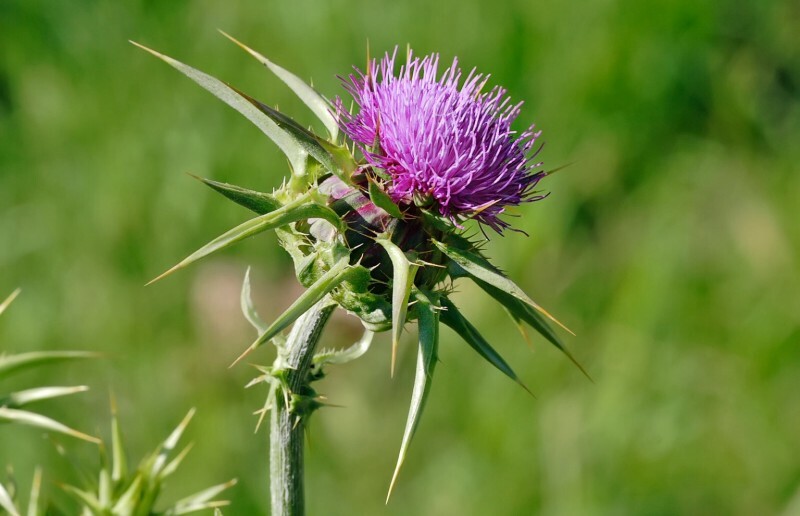 To date, fruit from 26 different plant families has been documented to be in its diet — including fruits from the podocarp, palm, laurel, nightshade, wild grape, and myrtle plant families. In addition to fruits, southern cassowaries are known to eat flowers, insects, fungi, frogs, birds, fish, mice, snails, rats, and carrion. 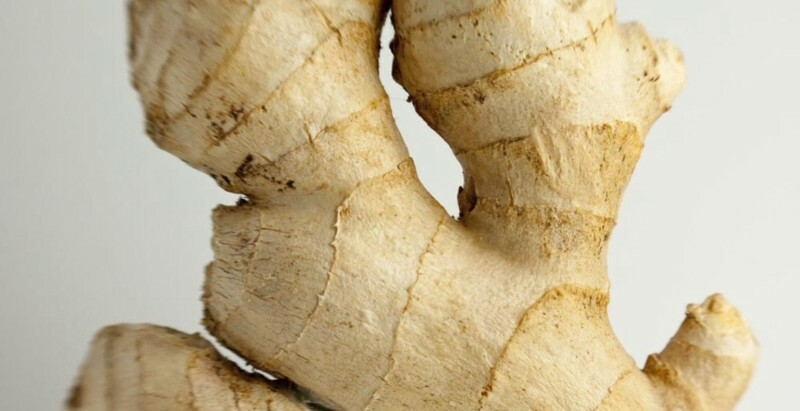 Very notably, the species is capable of safely digesting many fruits that are toxic to other animals. Feeding behavior more or less just involves swallowing food whole — including items as large apples and bananas. 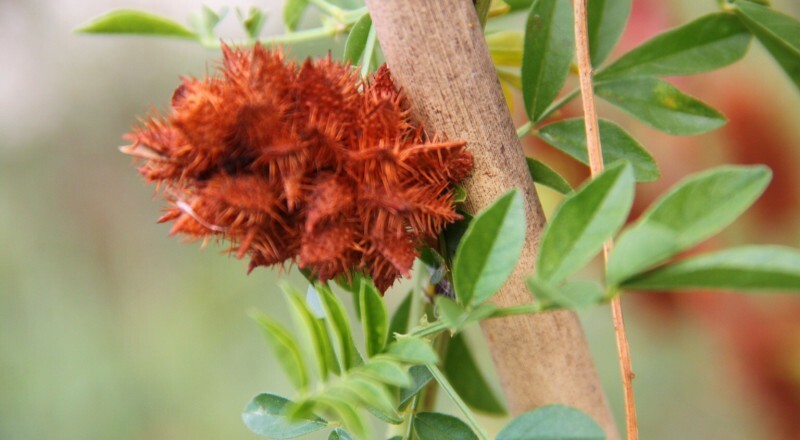 They are territorial of fruit trees when feeding, notably, and will defend a bountiful tree for multiple days until the tree has been depleted. The southern cassowary is considered to be a keystone species in the rain forests of the region owing to its very wide dispersal of viable sees across the jungle floor. The process of being partly digested seems to greatly increase germination rates in some of the seeds of the fruits eaten by the species. 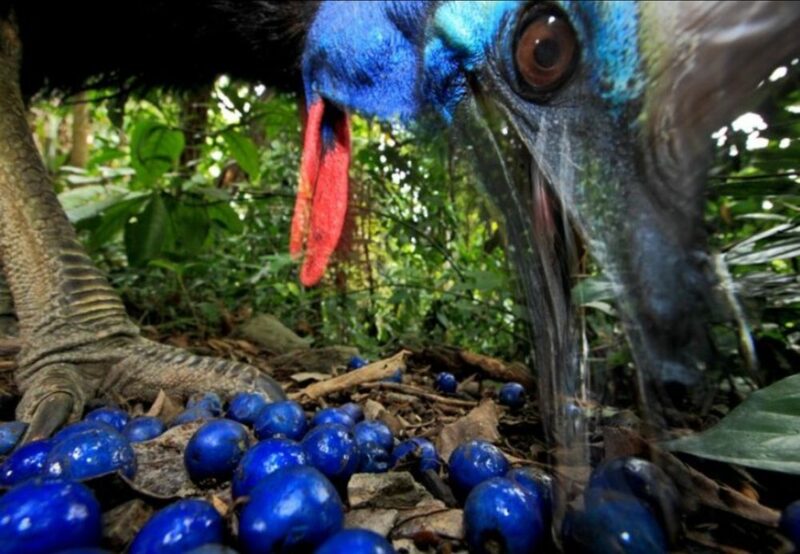 An interesting thing to note here, the fruits and berries of the region that southern cassowaries eat are strikingly similar in color to the birds themselves. 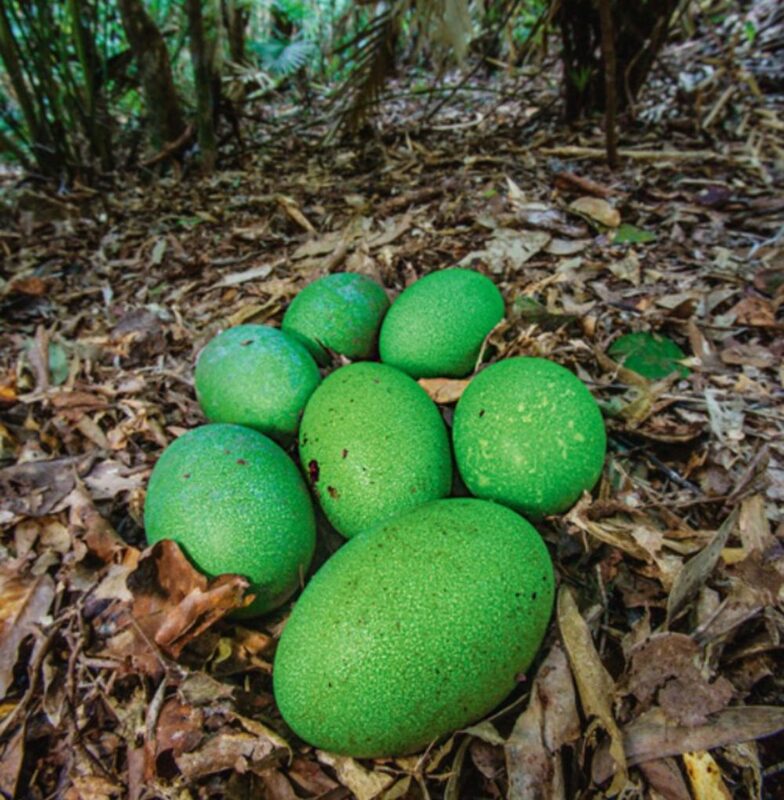 The eggs being the green color that they are is interesting as well — being completely different than the birds themselves and from the foods that they most commonly eat. Those wondering about the “casques” (the things on their heads) may be unsurprised to learn that there’s some debate on the matter of their use(s). While some have speculated that they help to protect the birds’ heads from falling fruit, and from collisions while speeding through the jungle at 30 mph, some research strongly suggest that the casques are related to the birds’ ability to produce the extremely low, deep, loud sounds that it does. The ability to produce low, deep, and loud sounds in a jungle environment is potentially a very useful trait, owing to the density of the environment — which limits sound transmission. Notably, the loudest land animal in the world, the howler monkey, lives in a similar jungle environment in South America. The inside of the mostly hollow casque is spanned with find fibers, interestingly, possibly related to an acoustic function. As far as behavior goes, southern cassowaries are mostly solitary birds. 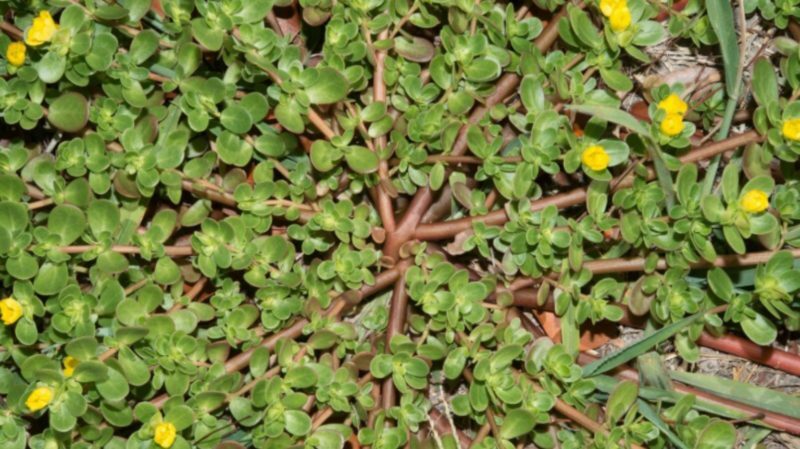 Breeding occurs either in late winter or in spring, typically. 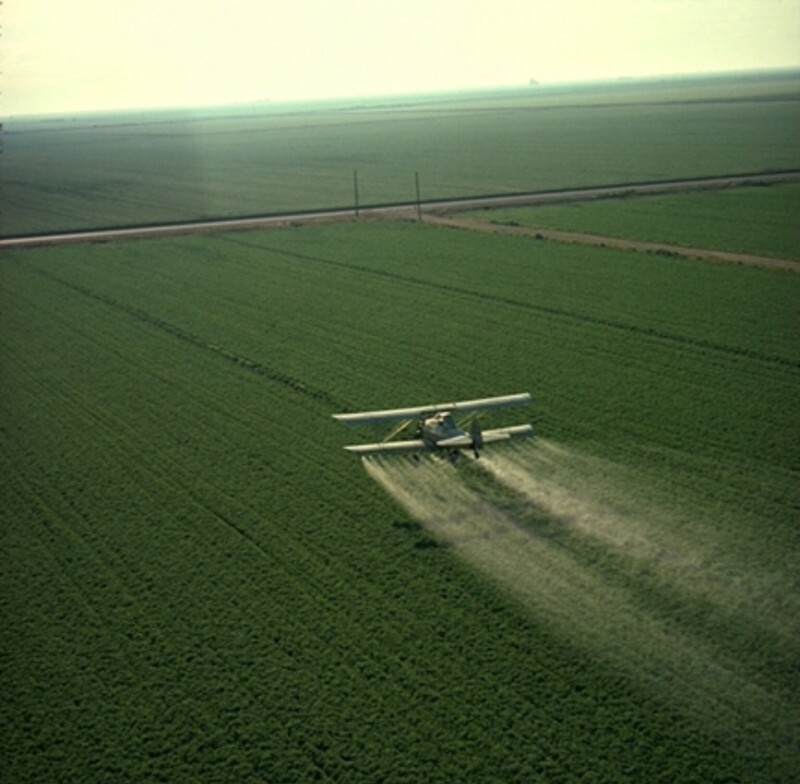 In preparation, the males build nests on the ground, composed of varying amounts of herbaceous plant material meant to help drain and wick away moisture from the eggs, as well as provide insulation. As noted at the start of the article, it’s the males that incubate the eggs and raise the chicks. 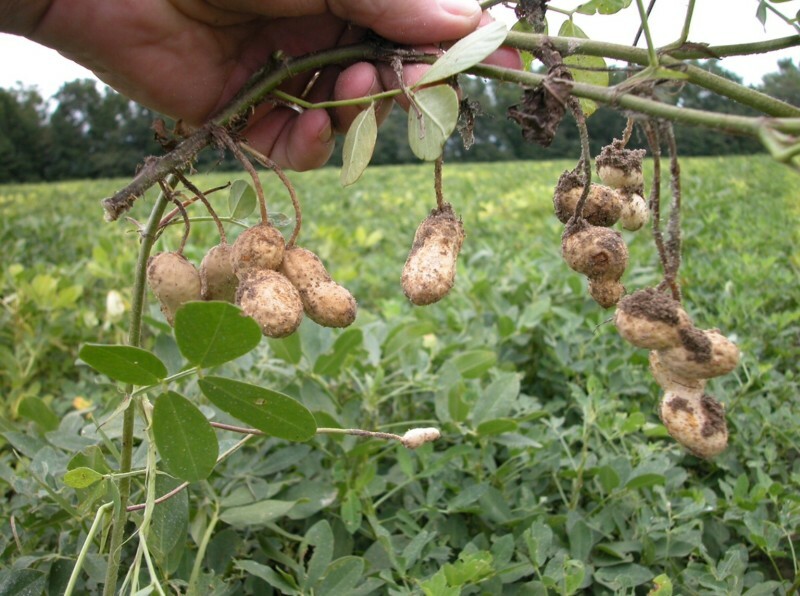 Clutch size is typically 3 to 4 eggs. Incubation lasts around 50 to 52 days typically, with the male periodically adjusting the amount of plant nest material to regulate temperature levels. The males are known to fiercely defend the eggs, and the chicks. The chicks stay in the nest around 9 months altogether, before the young males then leave the area looking for their own territory. The chicks utilize high-pitched whistle sounds to call the male when needed. Physiology is interesting, as southern cassowaries don’t possess tail feathers or a preening gland. They do possess wings, but here have been apparently reduced over time to consist of 5–6 large remeges of stiff, keratinous quills — like those of a porcupine, but no barbs. The second fingers possess claws though. Along with the furcula and coracoid being degenerate, the wedge-shaped body, and other traits, it’s thought that the adaptions relate to the rain forest environment, and being able to run through it at high speeds despite the presence of thorns, vines, and saw-edged leaves. As with most large and possibly dangerous animals, while reports of human fatalities aren’t necessarily false, the fact is that humans kill far more of the birds than the other way around. I certainly wouldn’t claim that the cassowary was the aggressor in that situation, though no doubt they probably sometimes are. Interactions with dogs, feral or otherwise, seem to be similar in nature — with dogs harassing and stalking the birds, or killing chicks, and the birds sometimes killing them as a result. On that subject, as a comment on the danger of southern cassowary kicks — there’s a report of a dog being kicked in the belly by one in 1995. The kick left no puncture wound of any kind, but the dog died afterwords as a result of intestinal rupturing. A study on the subject done back in 2003 found that, out of a total of 221 studied southern cassowary attacks, 75% of the 150 attacks involving humans were by cassowaries that had been fed by people. In these 150 attacks on humans: 73% seemed to involve birds stealing or expecting food; 71% involved the cassowaries charging or chasing the humans; 15% involved the birds defending themselves from human aggressors; 7% involved them defending their chicks or their eggs; 5% involved them defending food or trees with fruits; and 15% involved them kicking. 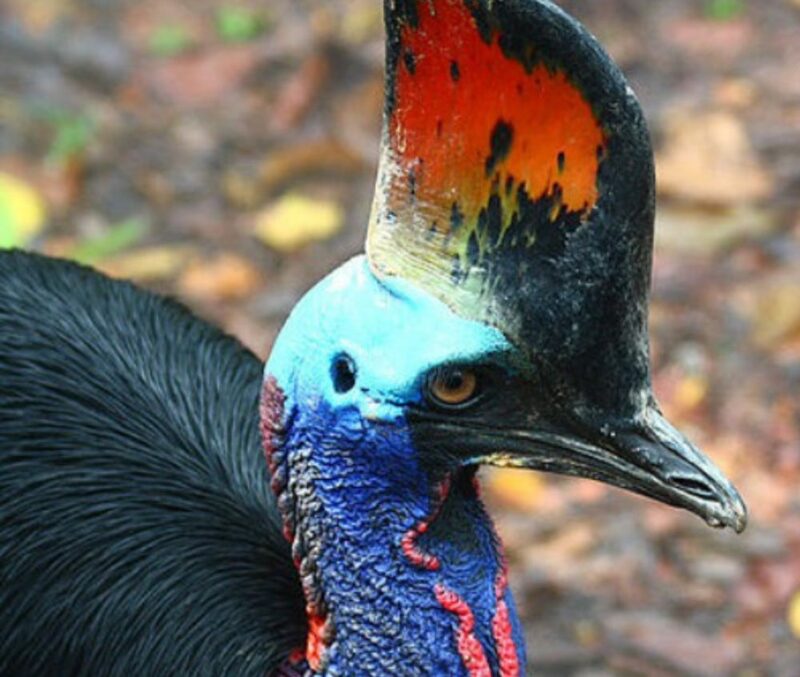 Overall not a picture that paints the southern cassowary as a malevolent animal, as some may like to portray it. So, the lesson here is don’t feed southern cassowaries or they become habituated and dependent, and don’t harass them or their chicks or eggs. How long this advice will apply, though, is an open question, as deforestation, endless development, expanding roadways (and thus expanding chances to become roadkill), and introduced generalists (wild boars, dogs, etc), continue to have very negative effects on the southern cassowary populations that still remain.